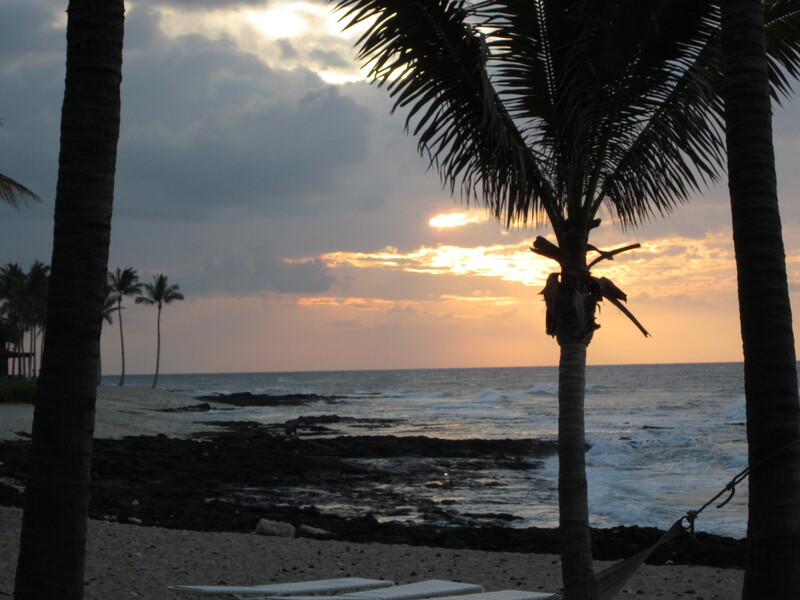 When classes end for the season and the days begin to get longer, even families that live quite far from the ocean’s edge begin to plan beach vacations. 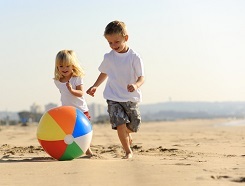 Fun in the sun and sand sounds like the perfect recipe for summer fun, but as with most other things in life, considerations change when you put kids into the mix. Before you pack up your brood for a few days at the shore, these are a few of the things you’ll want to consider. Great post by Sandra McAubre from Hire A Nanny. Very important and helpful information. i know I sometimes overlook the basics. I don’t know about you but I Love cooking with my kids, especially in the summer. There are so many fresh, local ingredients this time of year with all the fruits and vegetables starting to pop. Not to mention the longer days with more sunlight and no school the next day. Meals don’t always need to be quick and easy this time of year and with my kids, a meal that normally takes 30 minutes takes an hour. Which is fine, except it always seems that the longer a meal takes to make the bigger the mess that results. Therein lies my biggest flaw when it comes to cooking with the kids; I am a neat freak. Not a little neat freak either; I like a clean, well-organized kitchen. It may be that way before the kids get to work in the kitchen but five minutes in it looks like a tornado came through. Not a little tornado, one with the power to to blow utensils and ingredients two rooms over. I still can’t figure out how that happens when the kids haven’t left the kitchen. Any ideas? I sure would like to figure out how they do it. Letting go and just letting them learn and enjoy is something I am working on. I am getting better each time they set foot into the kitchen to start cooking. The last thing I want to do is be such a grump that they lose their passion to cook. As a matter of fact, my oldest can be pretty much be left alone now. He will just call Kerry or I in to ask us questions about certain things like measurements or what a certain ingredient is. Talking about measurements, those questions are a great way to sneak in math lessons without them even knowing! Back to my son. He has actually created some of his own recipes when we just let him go. How can I discourage that? Everyone in the family benefits this way. It’s also a great activity that doesn’t involve video games or TV and a fun way to get the family together after a hard day of work at Go-Go Babyz. Go-Go Babyz Wagon Stroller ~ Function and Versatility for Family Fun! As a parent it seems the modes of travel for the youngsters are endless and you really just have to find what works for you by trial and error. We have been diverse in our needs, using frame packs, soft carriers, strollers of all kinds and wagons for our endless excursions. When I heard about Go-Go Babyz Wagon Stroller I was intrigued. The Wagon Stroller is just that – a two-in-one option that even folds down to fit into most vehicles. 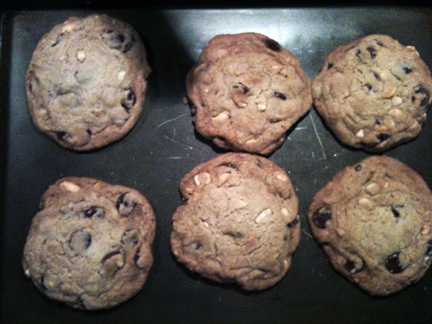 I knew this was something our family had to try!…. We just introduced our Wagon Stroller a little over a month ago and I have been hearing the question “What makes your Wagon Stroller different from other kids wagons?” a lot. So, I decide to answer it in our blog. 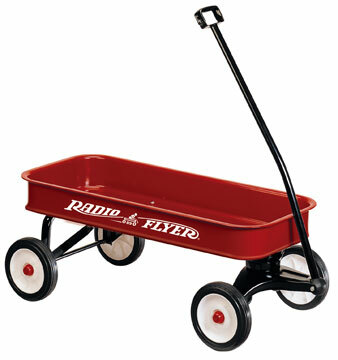 Who doesn’t remember the little red wagon of from their past; the radio flyer wagon. I have some fond memories of my wagon, not to mention some painful ones resulting from some of the stunts my friends and I would try and pull off with it; Flying down hills steering with the handle, tying a rope to the handle to be towed by a friend on his bike or just holding the rope and “waterskiing” from behind a bike. It was all good fun despite any road rash or goose eggs on the head. But I digress. After our own kids out grew the Travelmate and their baby strollers we noticed on vacations that there were still times that they didn’t want to walk because they were so tuckered out from the day’s activities. We always saw people using these little wagons, plastic ones, wooden wagons, folding wagons, utility wagons and even the radio flyer wagon to transport their kids around as if it were a stroller. Great idea right? Sure, except that these different wagons are NOT strollers and do not have all the safety features that a baby stroller has. So we thought, would if we designed a wagon stroller? One that was designed to meet the ASTM safety standards for strollers that could be used as a single stroller, a double stroller, or just a wagon cart to lug around your tuckered out older kids and all their gear? So we did. Behold the all new Go-Go Babyz Wagon Stroller. 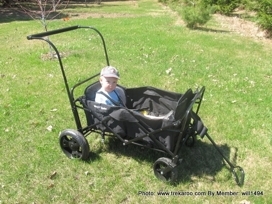 So, what makes your Wagon Stroller different from other kids wagons you ask? 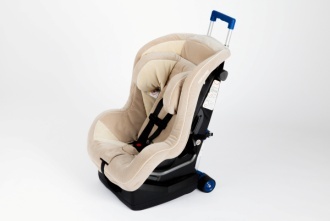 As I mentioned above we designed it to meet the ASTM safety standards for strollers. Accommodates 1 or 2 cushioned seats with a 5-point safety harness (optional). It has a rear foot brake not found on any other wagon. 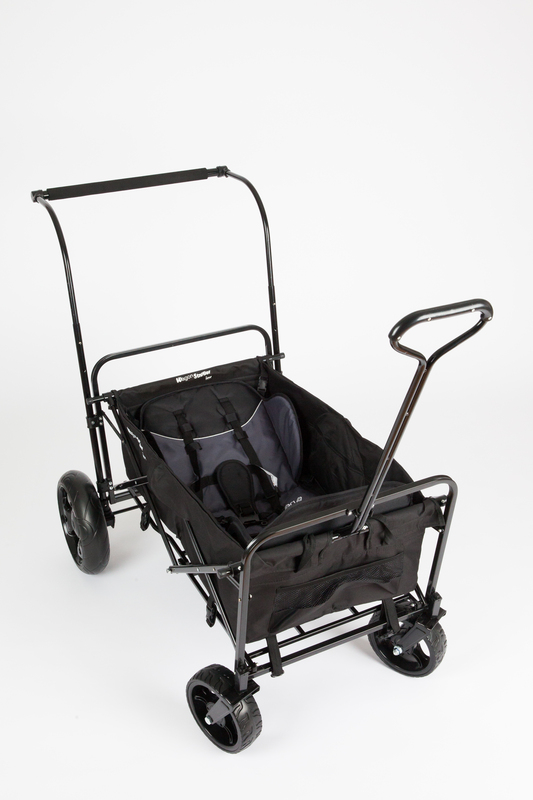 It comes with a standard wagon pull handle as well as a rear push handle so it can be pushed like a stroller (extended, curved handle option available for added comfort. Standard on the single or double stroller models). Larger rear wheels for better stability and handling on a variety of terrain. 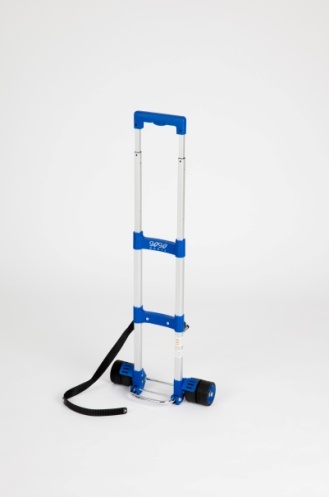 Larger side-to-side AND front-to-back wheel base for better stability and to prevent tipping. Inspired by the radio flyer wagon of our past and influenced by the style of the current utility wagons and folding wagons it is different than any other wagon on the market. It is truly a Wagon Stroller, whether you need a single stroller, double stroller, or just a wagon cart, our Wagon Stroller will meet your needs and provide the comfort and safety you want for your kids.